First of all, we would like to congratulate you on your very special day. We also thank you for your interest in our warm and peaceful island, our ideal hotel and our great wedding facilities. We are so pleased to be part of your plans to celebrate and host your wedding. Each members of our staff is looking forward to helping you make your experience the best ever. We can offer the perfect combination of a great location, excellent facilities and efficient wedding planning. 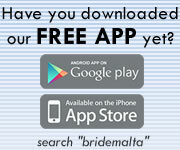 Gozo is the island of love and romance. Its beauty has attracted visitors from all over the world who wish to see its idyllic, terraced countryside, to tour its historic sites, to dine on sumptuous food and wine, and to relax as the Mediterranean Sea washes across the island shores. 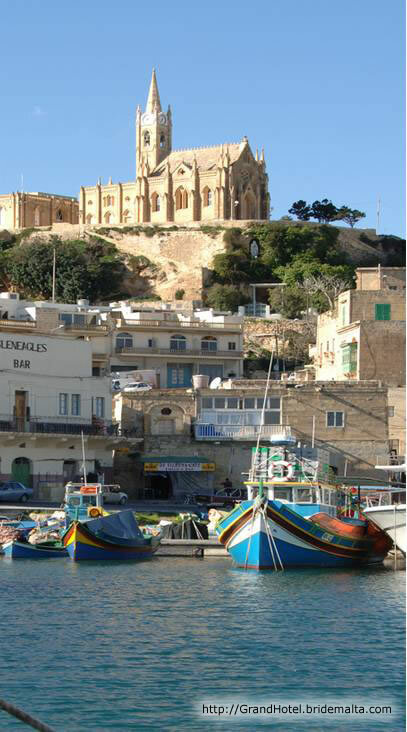 Gozo has a warm climate, rich architectural heritage, stunning sceneries and picturesque towns that seem lost in time. If you want to create an unforgettable ambiance for your wedding, you will not be disappointed in selecting Gozo as the destination for your ceremony Historic churches with remarkable masterpieces of art, or charming chapels can be the perfect setting for exchanging your vows! 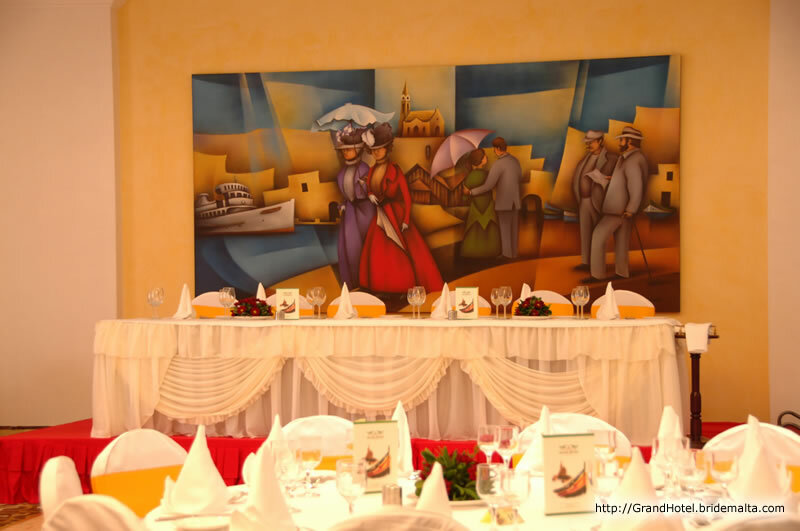 The Grand Hotel is situated on top of a valley overlooking Mgarr Harbor. The hotel enjoys panoramic views of Malta and Comino across the Gozo channel. The to and fro of the fishing boats and the incomparable vistas add a romantic touch of the excellent hospitality offered at the hotel. Our people are dedicated, caring and will deliver your event with style and confidence. They are our ambassador and human face and are therefore a vital ingredient in our success. Our service staff are professionally trained. For them nothing is too much trouble. They are committed to consistently deliver an outstanding level of service. We consider each wedding a unique and unrepeatable event and we pit all our efforts into creating a personalized reception. Our facilities and services can be tailored to the style that best represents you and complements your wines and dreams. The Royal Lady Suite with its classic wedding hall setting, the Grand ballroom with its unique ambiance offering a world of sumptuous style and the roof garden restaurant with spectacular views of the Mediterranean Sea are three magical wedding reception settings to make this special day an unforgettable one. Whether you are envisioning the most intimate gathering or a grand-scale occasion for up to 500 people we have the place for you. Using only the finest and freshest ingredients, our highly experienced chefs will incorporate the latest trends into the mouth-watering dishes they prepare especially for you. 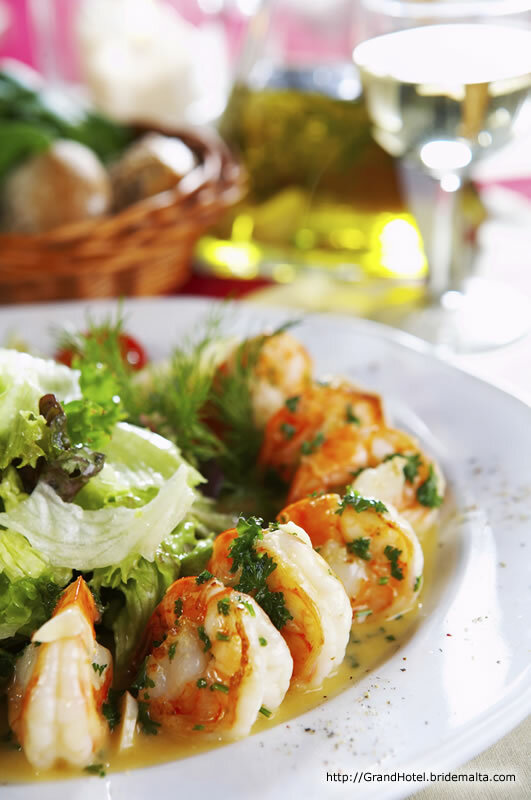 We are known for preparing only the freshest food and can offer you everything from Continental to Mediterranean cuisine to Eastern fusion, featuring delicious poultry, meat and seafood prepared by international chefs. 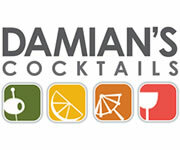 Our menu and the service we provide are designed to be as distinctive as your event. So, turn your wedding into a true extravaganza whether it is a buffet dinner, cocktail reception or gala dinner. 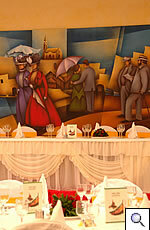 Our experienced consultants and trained culinary team will assist you in planning and executing your special day. From intimate to grand, lavish to informal, we can create the perfect catered menu, decor and ambiance for your special event. If you do not find what you are looking for we will customize a menu for you. We will assist you in every step of the way! 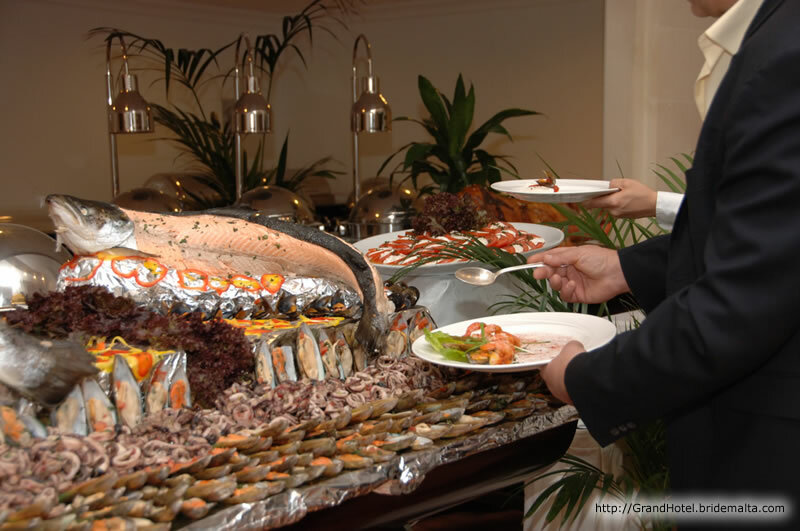 Whether it is a sumptuous buffet with mouth-watering antipastos, freshly made pastas, Mediterranean seafood, live cooking and exquisite choice of dessert, fork reception or fine dining we can customize your menu to your unique taste. 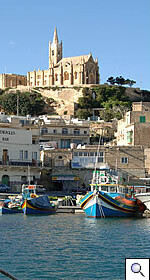 Gozo is an island steeped in religious tradition. And this is most visibly reflected in the numerous churches that are scattered in every town and village. 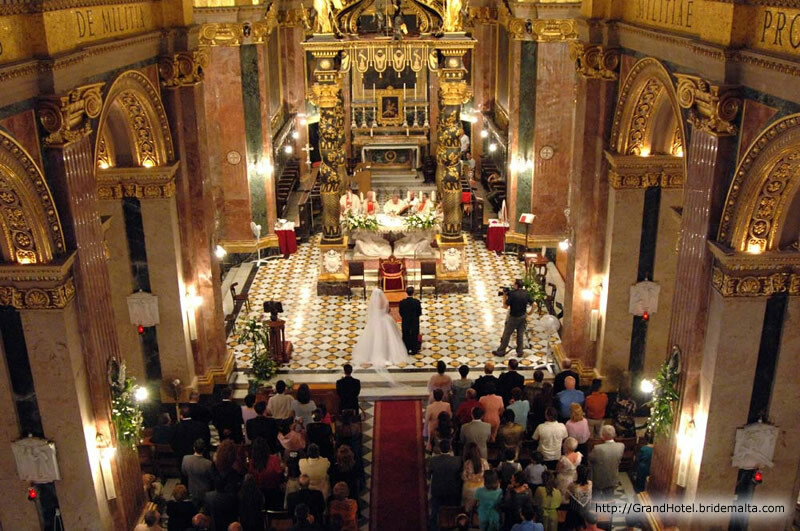 With so much diversity in architectural style you are virtually guaranteed that in Gozo you are going to find a church that matches your preferred choice of a wedding service. 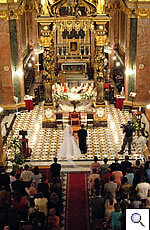 Church weddings can be held in Catholic churches with special permission from the local religious authorities. We can help you with all the necessary documents ad permits in connection with both Catholic and Protestant ceremonies. If you plan on holding the civil ceremony in our hotel, we can arrange for the public registrar to conduct the brief function here as well. While we are busy taking care of your wedding there is always something to do during your stay at the Grand Hotel, in Gozo. You can marvel at the oldest free-standing structure in the world of Ggantija, Xaghra, gaze through the azure window in Dwejra, or stroll on the red sands of Ramla beach. You can navigate the undulating hills and countryside by jeep or bicycle or on foot. You can survey the entire island from high atop the ancient Citadel fortification in Victoria. The setting is elegant and the menu is exceptional in every way, but the real key to the Grand Hotel's special service is our experienced professional event planners. You want to enjoy every moment of your wedding day, and not have to worry about the details. That is what our staff is for... to take pride in seeing that even the smallest detail of your wedding reception planners will handle it all: from the hiring of musicians and photographers, to the selection from a variety of luxurious transport services, from arranging the flowers, to designing customized menus and luscious wedding cakes. We oversee every detail of the wedding day, and are more than ready to assist with your floral decor, romantic lighting, entertainment, photo and video services, and the coordination of all aspects of your ceremony. This page has been visited 7200 times.